For me, I think this proves that a masters degree is the new bachelors degree. For the next generation, will everyone need a Phd to get an ROI out of school? For decades we have argued about education’s merits and ills, real or imagined. But while there was still a positive return, demand grew and we were able to educate our nation and workforce. We have now reached a tipping point. The ROI of education has diminished for all and become negative for many. 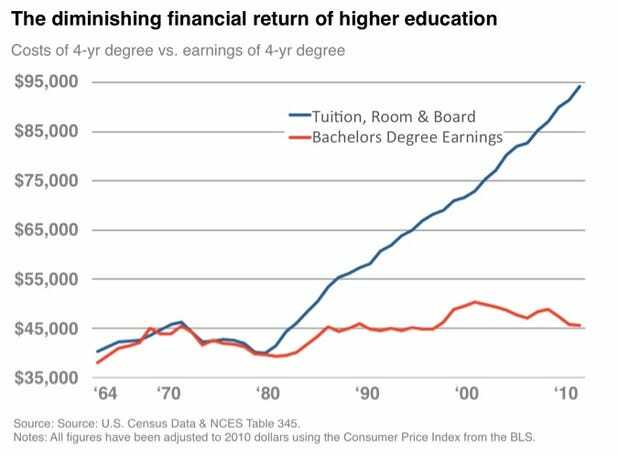 We have lost the ubiquitous positive financial return on education. Sector and Business Cycle Investing – Fidelity Investments	Sector and Business Cycle Investing – Fidelity Investments. Calculating the Costs of Investing in ETFs – WSJ	Calculating the Costs of Investing in ETFs – WSJ.